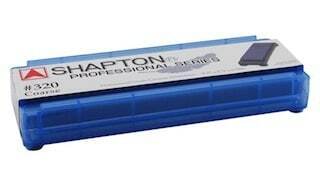 The Shapton Sharpening Stone Professional Series consist of some of the very best sharpening stones available. Originating in Nabatame, Tochigi Province, Japan, the company has been around since the middle of the 20th century. 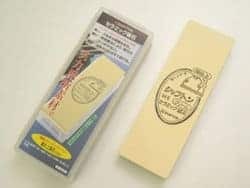 With over 50 years in the game they are widely considered to produce some of the highest quality sharpening stones on the market. They are also one of the hardest. This hardness makes them incredibly durable. When compared to most other whetstone brands they stay flat for longer, and need to be dressed less frequently. There are a number of other reasons that Shapton stones are seen as market leaders. Firstly, they are made from the carefully graded ceramic particles; these are also incredibly dense leading to the aforementioned hardness. There is also a high degree of uniformity of the particles throughout the entire stone. This means that the quality of sharpening / honing is maintained whatever the grit level. This particular attention to high-grade particle composition, gives Shapton the edge when it comes to just how fast their stones are able to sharpen. Furthermore, so confident are Shapton in their grading system, they are the only manufacturer on the market that grades their’ abrasives sizes to 2 decimal places. An additional design perk is that Shapton stones use tempered glass on the underside. Not only does this make them 100% warp free, but also allows for the grit rating on the underside to visible at all times, (when in use with a glass holder). Shapton stones will sharpen and hone your edges very fast indeed. In fact this can sometimes take a little getting used to. The sharpening experience does feel different when using such hard stone. You feel the hardness of the stone and with seemingly nothing wearing away it can be difficult to judge whether it is performing properly, especially if you are used to much softer stones. 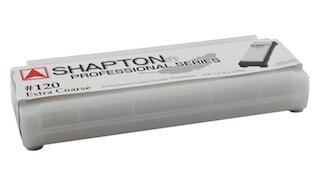 The video below reviews the performance after using a Shapton Professional 320 grit, 1K and 5k. To highlight the difference when using a Shapton stone, their 120 grit stone performs and sharpens just as quickly as a 240 grit stone from Matsunaga. The Shapton holds its surface flat for a lot longer too. 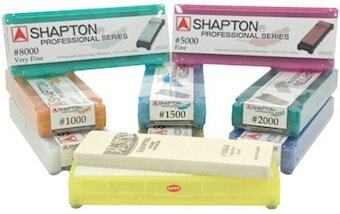 Likewise, the Shapton 1000 grit cuts quicker than other Japanese waterstones of the same grade. It also gives a slightly rougher edge too, (performance wise it could be better compared to a traditional 800 grit stone. Going right up to the high grit stones, the Shapton 8000-grit will only provide a minimum polish to the edge, in some cases leaving more of a matt surface than an end shine. However this does not affect the overall sharpness of the restored edge, with it being almost dangerously sharp if used in the wrong hands. The following table is the manufacturers recommendations when choosing grit sizes, and the gradations in which they should be used, to properly sharpen different kinds of knives and tools. Please realize that this is intended as a guide, and that those familiar with their tools can decide themselves which grains to use. An important issue you need to be aware of when using Shapton stones, is that they should not be immersed in water for any longer than necessary, (and certainly not over night). There also are a number of instructional videos on the Shapton website that give guidance on how to use their products.